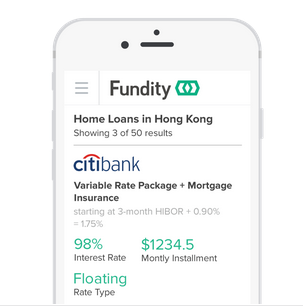 Fundity helps you find home and personal loans. We're a modern loan broker that costs you nothing. For years, banks and money lenders have sold complex products soaked with fine print. Beneath their products are layers of hidden fees. They employ loan agents who refer business to them - another layer of fees. People don't want to go through all the loans to find the best one. They don't know which one is the best. They don't know when to refinance their loans. They end up paying more financing fees than they should. What's more, it is often the less privileged consumers who end up paying more. We believe everyone - credit-worthy or not, finance-savvy or not - should have equal access to sound financing. We use technology to help you compare and apply for home loans from over 20 banks and money lending companies to get you the best rates (and btw, we build technology for the world's leading companies). We earn our keep through small and transparent fees. We hope to change consumer finance, a little step at a time. Hi, we're Fundity. We're a better kind of loan broker. We help you find home and personal loans at the best rates. Submit a single loan request on our platform and we help you liase with multiple banks and money lenders to find the best deal for you. What's more, it's completely free, no hidden fees and fine print.